Heated igloos seem to be popping up everywhere on social media. 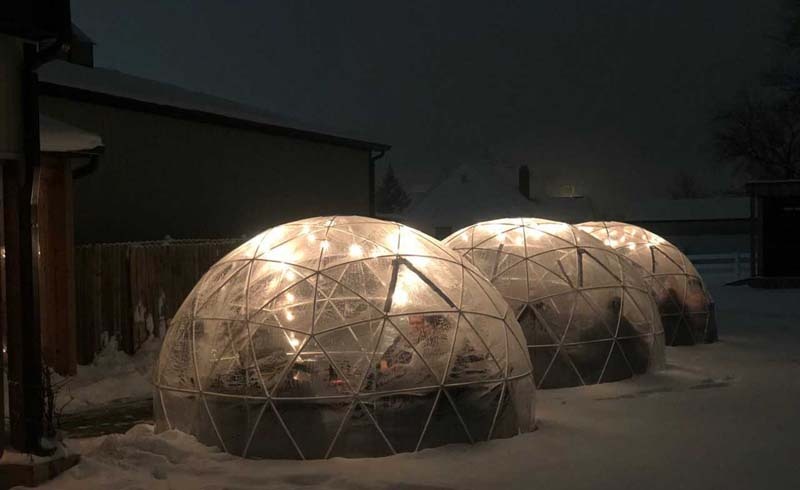 Wine and dine in heated domes that let guests stay outside in winter months minus the snow and bitter cold. The patio experience doesn't have to end when the weather grows colder. Heated igloos can be a good cure for cabin fever, and many offer rooftop views of your favorite cities. Your friends are going to be "snow" jealous once they see all your photos. Even though these igloos are heated, you're going to want to bundle up, since the domes can still be a bit chilly inside. Sit back and relax with craft cocktails, cheese plates and in some places, music. Here are 5 of the igloo trendsetters. Cross a heated walkway, then sit under sparkling string lights while sipping out of a keepsake mug and enjoying city views. 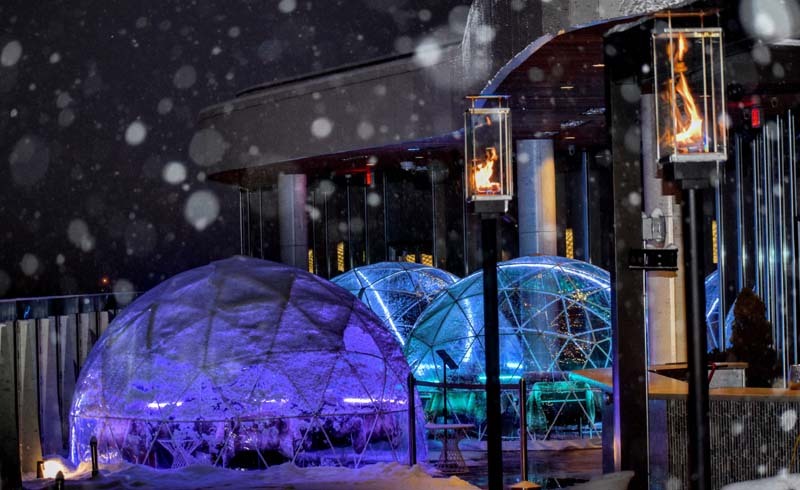 Six domes can each seat eight people for a 90-minute igloo session, with a couple of food and drink packages available at the time of your reservation. Domes are $200 to rent, and guests must be 21 and older. This is the first year Cafe Benelux has offered the igloos as a way to use their rooftop patio in the winter, and they've been popular enough that the cafe expects to have the igloos again next winter. The menu differs from what Café Benelux usually serves, sticking to more snackable items such as sliced cheeses and meats. Warm drinks like hot toddies and mulled wine are also offered in additional drink packages. 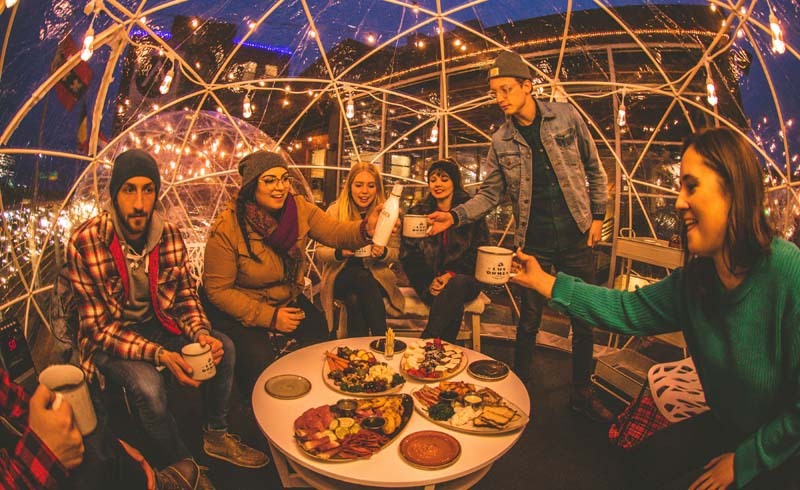 BAD Brewing sets up three 11-person igloos in their beer garden; two can be reserved (minimum of eight people), while one is first-come, first-serve. All igloos are all self-service. The cost for 2 hours and 50 minutes in an igloo is $35 Sunday through Thursday and $75 Friday through Saturday. Enjoy craft cocktails and mezze plates on Aba's rooftop patio while taking in views of Chicago. The space is semi-heated and can fit up to eight people. Signature dishes include Crispy Short Rib Hummus, Char-Grilled Lamb Chops and Skirt Steak Shawarma. Watch the snow fall from inside your snug heated igloo with drinks and pizza that's delivered to you. Igloos cost $10 per hour and can be rented for up to three hours. Each igloo is lighted and has music. This is the first year Urban Vines has had igloos, and spots for the domes have been mostly full in past weekends. "We thought they were a really cool idea," said Noah Herron, owner of Urban Vines. "They looked really cool on social media." The igloos will be up until late March. Each igloo can sit eight, and they overlook a pond and the vineyards. Dine on Spanish cuisine and sip creative cocktails on Vaso's rooftop in one of their cozy igloos. Each seats six people; the domes will be open through March. Igloos rentals cost $100 or $200 per hour depending on the day of the week.